PC based this powerful analyser will run at up to 500 MHz on 96 channels or on 160 channels at up to 250 MHz. Our logic analyser captures the data that is important to you. Its sophisticated 16 level triggering lets you fine tune the exact point to start capturing. The deep data buffers allow you to capture up to 512K samples of data. This is important when triggering on an error condition where you need to see the sequence of events leading up to the problem. Other analysers with smaller buffers won't give you this power. Not only can you capture huge amounts of data; you can use the continuously variable pre/post trigger positioning to define exactly how much of the buffer is used to store events before and after the trigger. Logic Analyser front panel software. High speed operation (up to 500 MHz). Deep data buffers (up to 512K samples per channel). Simply put, the deeper the buffer the better. Has extended data logging capability which captures sequential buffers to disk files. Continuously variable pre/post trigger position. This combined with the large data buffer gives you the power to store up to 512K events surrounding the trigger point. Up to 160 data input channels. High Impedance probes that minimise interference with the circuit under test (1Mohm by 5pf). Work with up to 8 different logic thresholds variable between -8 and +16 volts like TTL, ECL, 3V logic, CMOS, or RS-232 at the same time with our multiple threshold voltage selections. External trigger output. Use this to trigger other instruments, like your scope. Very high data bandwidth up to 100 MHz. 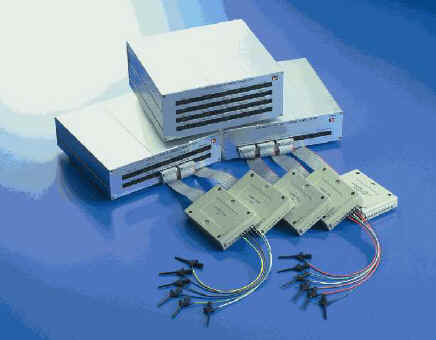 8 External high speed clock inputs with user definable combinations for flexible clock qualifying (50/80MHz for 42/45). Captures both state and timing simultaneously with one probe. Optional very high speed pattern generator with rates up to 100 Mbit/s from 16 to 160 channels. Set-up/Hold Time - 2 ns / 0 ns. Threshold Voltage - Variable ( -6.52 V to +6.12 V ). Pairs of pods may have different voltage settings. Impedance - 200 KOhm shunted by 3 pF. Maximum Input Voltage - Inputs are clamped through a 200 KOhm resistor. ±150 V Cont., 250 V Trans. Sampling Clock - (5540/80/160) 500 MHz, then in ratio 50, 25, 5, 1 to 1 Hz. (5240/80) 200 MHz, then in ration 5, 1 to 1 Hz. Qualifier - The eight external clocks can be used as qualify lines. Data Skew - Channel to channel, < 2 ns typical. Trigger Conditions - 0, 1, and DON'T CARE for all channels. Pass Counter: 1 to 255. Trigger Edge - Rising and falling. Trigger Levels - 16 sequential. Trigger Position - can be set anywhere in the capture buffer. Repeat Randomly - Automatic captures at set time intervals independent of trigger words. The software works in real-time like a stand-alone oscilloscope. What this means is that operating parameters like clock rates and threshold levels can be changed on-the-fly while in repeat capture modes and that data will be continuously updated in real-time on the screen in timing or statelist modes. The software is very easy to use and most functions are set directly from the main screen. The software is controlled by single key 'hotkeys' or can be set to be menu driven. Windows based operation ( 98/ME/2K/NT/XP/W7 ) is fully supported: 24 selected channels may be displayed on screen at one time as a waveform. Time between two cursors, and trigger are displayed. Alternatively data may be displayed in ASCII, binary, decimal or hexadecimal formats. See the screen shot above. This option on our 5000 series logic analyser allows you to view I2C codes from a separate window within our Windows based control software. Displays I2C commands. Start, Stop, Read, Write, Slave address, Address, Data, Ack, and Nack. Displays Timing View of all activity on the Clock and Data lines showing you everything that happened, including valid I2C codes, glitches, timing errors, and other non-I2C data. Since this is a Logic Analyzer you have plenty of other channels to monitor the rest of your circuit while still viewing the I2C bus. Compare I2C codes with actual circuit behaviour. Are your commands actually doing what you expected? You have an entire Logic Analyzer worth of resources to verify and debug your circuit response. What makes this product so superior to other I2C Monitors is that you will also be able to see all activity on the Clock and Data lines in Timing and State list display.